The rural water district was established in 1966 as Vernon County #4 to provide ample, safe and convenient water for people living in rural areas. The orginal district consisted of approximately 20 miles of pipe, and water was purchased from the City of Nevada for distribution to the patrons. In 1978 the first well was drilled to provide for better water and growth. In 1980 Vernon County #4 and Vernon County #3 (Schell City/Harwood) consolidated and became CPWSD#1. In 1982 the second well was drilled to provide an adequate supply of water to the newly consolidated district. In 1994 a third well was drilled in the southeast part of the county to help serve new customers in that area and help backup the existing system. 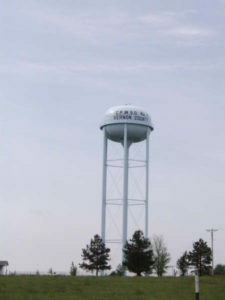 In 2005 CPWSD #1 consolidated with Public Water Supply District #5 (Ketterman area), gaining approximately 100 new customers. April of 2009 was the official date of the consolidation between Public Water Supply District #6 (Richards/Horton area) and CPWSD #1, with CPWSD #1 gaining approximately 250 active customers. In mid-2013 we started reselling water to PWSD#1 of Moundville on a full-time basis after serving as only their backup for several years. Well #4, located north of Dederick, was drilled in 2012 and a 300,000 gallon storage tank was erected in 2014. Both were put into operation in 2014, allowing us to resell water to the City of Schell City and serve our northeast part of the county with greater ease. In 2016, a secondary feed to the Richards/Stotesbury area was completed at Horton, allowing Well #4 to also provide additional water to the northwest area of the county. In September 2017 we consolidated with PWSD#1 (Moundville/Bronaugh area). We acquired approximately 300 additional customers and territory that goes south to the Barton County line and east to the Kansas state line. This area includes the City of Moundville, but not the City of Bronaugh. CPWSD #1 continues to operate very productively, serving over 3,600 active households and farms throughout the majority of Vernon County. We continue to strive to provide the very best service to our customers, while maintaining over 1,000 miles of transmission lines.